1 large tomato, finely chopped. 2 medium potatoes, boiled and cut into 1/2-inch cubes. 2 teaspoons chaat masala powder. 2 tablespoons Date and Tamarind Chutney. 4 tablespoons fresh coriander, finely chopped. 1. Bring three cups of water to a boil. Add the corn kernels and continue to boil for three to four minutes. Drain. This bhel can be made with hot or cold corn kernels. 2. 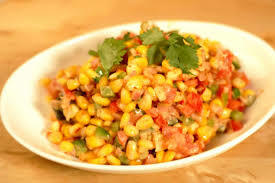 Mix together the corn kernels, onion, tomato, potatoes, chaat masala, chillies, chutneys and fresh coriander. Add the lemon juice and salt and mix. Divide into individual servings, sprinkle the cornflakes and serve immediately. 1. Corn is one of the mostly usable cereals grain. It is a good source of antioxidant carotenoids. Corns are very healthy foods for eyes. Such like lutein and zeaxanthin, yellow corn can protect eyes. It is also a great source of numerous vitamins and minerals. It is an excellent snack for the hungry hordes. 2. Corn provide protein and fiber as well. It consist of greate source of fiber that gives chewing satisfaction. Cron provides the foundation for tortillas, burritos. It is a good snack stater food. It mostly comes in the form of popcorn. In U.S corn is consider as an important source of healthy food. 3. Corn provide the benefits of antioxidant. It is a great source of mineral manganese. It provide vitamin B1, B5 and folic acid. We know that fiber and protein are main source for stabilizing the passage of food through our digestive tract. Various studies in U.S has proved that corn improve overall nourishment.